 What does That verse mean?  How should I interpret this passage?  What is the significance of this word or phrase in Hebrew or Aramaic?  How do Bible-time customs help me understand the meaning of this passage?  How does the information on the author, historical background, and features of a Bible book help interpret that book? Bible Knowledge Commentary - the Old Testament by Walvoord;Zuck was published by David C Cook in December 2003 and is our 31893rd best seller. 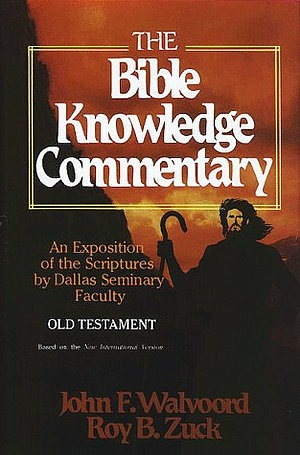 The ISBN for Bible Knowledge Commentary - the Old Testament is 9780882078137. Be the first to review Bible Knowledge Commentary - the Old Testament! Got a question? No problem! Just click here to ask us about Bible Knowledge Commentary - the Old Testament.